Reports on the elections that lead to the fall of Kahinda Otafiire lost his place as an MP aspirant for the General election in 2016. So he will not be the MP for the Ruhinda South-Mitooma District. He lost to another brother on the ballot who actually is in jail! But first I will address the person and few of his previous actions and issues that he has had in recent years in his position as a government official. So that if the public known all of this it’s a miracle that he is still been staying as a MP and representing this area for that long with all this stories. So hopefully the brother who is jailed and Aspirant for Ruhinda South – Mitooma District has more clean hands then Otafiire! Take a look. “I have been with President Museveni for more than 40 years and he has not sent me to my voters. How does he start sending you who have spent the shortest time with him?” (…)”You will be saved by your deeds because at the level of primaries, we are all equal and stopping someone from standing would send a bad signal to the people” (…)”Don’t forget that we have competitors in other political parties who are seeing whatever we are doing. Just identify your weaknesses and plan to be stronger rather than blocking other people who want to stand against you” (Zadock, 2015). “I don’t think I am stupid as I appear. With all due respect, you’re insulting my intelligence” (…)”I don’t remember writing that letter although it has a signature resembling mine” (…)”I know Kasango as an officer of court. The documents were signed by Justice John Keitirima, whom I know well. I had no reason to doubt” (Walubiri, 2015). “Tamale Mirundi should leave issues of the generals to the generals.” Commenting on Tamale’s verbal attack” (…)”I am 85kg, do you think I have become big because of corruption?” (…)”what was a wetland doing in the middle of a city?” questioning the Nakumatt vs Nema saga” (…)”Even Museveni knows I am fire” (…)”I don’t like this nonsense. That is my private life, it has nothing 2 do with my public life as Minister. Whether I am taking my family out or not is none of your business. You fellow can u concentrate on what concerns u and leave Otafiire’s family alone.” In response to Daily Monitor concerning his Christmas plans” (Ortega, 2013). “Taking advantage of his senior position in the elite network that effectively plundered diamonds, coltan, timber and Gold in eastern Congo, Otafiire set up lucrative business enterprises in the neighboring country and refused to pay taxes, as reveals the 2003 final report of the United Nations Panel of Experts on Illegal Exploitation of Natural Resources and Other Forms of Wealth of the Democratic Republic of the Congo:” (…)”Members of the Ugandan network are typically tax exempt. The Panel is in possession of documents showing that the network uses its control over the RCD-K/ML rebel administration to request tax exonerations for imports of high-value commodities. The granting of numerous tax exonerations to UPDF Colonel Otafiire between late 2001 and early 2002 is one of numerous cases. Not only did Colonel Otafiire benefit financially but, eventually, those exonerations forced local competitors out of markets in Bunia and Beni, leaving the petrol trade largely under the control of the network” (…)”Even in his own country, Uganda, Otafiire is routinely accused of abusing power. Fourteen years ago, he was dragged to a parliamentary probe committee for allegedly stealing copper rivets worth billions of shillings from an Asian businessman. 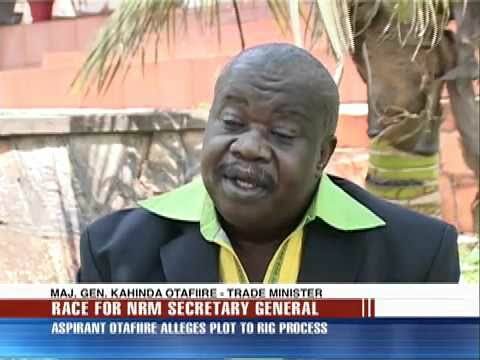 In 2007, Kahinda Otafiire abused his office as minister of local government when he fraudulently allocated the Nakawa-Naguru estate redevelopment project to Opec Prime Properties Ltd, according to a 2008 report of the Inspector General of Government” (Sseremba, 2012). “Obote put it more succinctly to Andrew Mwenda:” (…)”Maj. Gen. Kahinda Otafiire, for example, revealed that the National Resistance Army rebels used to wear UPC colours and then go into villages in Luwero and kill people in order to make the people think these were actions of the UPC government. Otafiire was boasting of the “tricks” NRA employed to win support in Luwero, but was also revealing the sinister side of Museveni and his insurgents… Each time there was a reported case of mistreatment of civilians by the army, we arrested those responsible and punished them severely” (Kalyegira, 2010). “Maj. Gen. Kahinda Otafiire, the Minister for Water Lands and Environment, last month fixed the price of water in rural areas at Shs 10 per 20-litre jerry can” (…)”Until last month, prices varied from one area to another, depending on operational costs. Because costs differ, there is fear that a uniform tariff will jeopardise the operations of the water systems and lead to their collapse. This is because the companies can only continue running the water systems if there is a profit to make” (…)”However, Otafiire this week dismissed such fears, saying that the new water tariff aimed to make accessible it to every one. “It was a bad policy. I am the minister and I have changed it,” he said of attempts to develop a business model. “Water is not for commerce. If we can give free medicine, why not free water?” He said only two water schemes with electricity-powered systems would get government grants to subsidise their power expenses” (Kavuma, 2005). “KENYAN police are investigating a possible link between Maj. Gen. Kahinda Otafiire to a large consignment of sugar currently impounded in Mombasa over tax evasion, but the Local Government minister has denied involvement in the racket” (…)”The huge consignment, worth about Shs 850 million was impounded at Mombasa seaport several months ago after authorities realised its destination papers had been falsified to avoid paying taxes due” (…)”If the racket succeeded, said Port CID Chief Mr John Nyanzwii, then the owners would have evaded the 100 per cent duty paid for imported sugar and the import duty due to the Uganda Revenue Authority. The sugar would have appeared to have originated from Kenya” (…)”Although police authorities in Mombasa had information that the Sugar belonged to Uganda’s local government minister, Maj. Gen. Kahinda Otafiire, he denied the allegations in a phone interview with Daily Monitor last week” (NFV Zone, 2007). “THE Minister of Water, Lands and Environment, Maj. Gen. Kahinda Otafiire, crashed his car on Saturday morning and drew a gun at a journalist who came to the accident scene.The incident took place on Kinawataka Road, off the Old Portbell Road at 2:30 a.m. Daily Monitor photo-journalist Mr Mike Odongkara was put at gunpoint by an angry Otafiire and manhandled by policemen who were called to the scene to rescue the minister” (Odangkara, 2008). “I might have to join another party. I won the elections but my name is not on the list [of party flag bearers released this week]. They are chasing me away. What do you want me to do?” (…)”“If you were in my shoes, what would you do?” (…)”You cannot petition someone who does not want you” (Kiggundu, 2010). “Justice and Constitutional Affairs Minister Kahinda Otafiire yesterday failed to show up in court to explain his side of the story in a case in which petroleum giant Shell (U) Ltd sued him over alleged breach of contract“ (…)”Gen. Otafiire, through Benzina (U) Ltd, allegedly negotiated a land lease deal with Shell (U) but later failed to honour it” (…)”The petroleum company now wants a Shs1.2 billion refund for refusal to deliver land to it, which it says resulted in loss of business.” (Wersaka, 2012). “Minister for Justice and Constitutional Affairs has been thrown out of Parliament for Government’s failure to appoint substantive DPP as Cases pile up and suspects spend longer time on remand without trial” (…)”Appearing before the parliamentary budget committee to present the DPP budgetary estimates for this financial year, MPs today ordered Major Gen Kahinda Otafiire out from Parliament accusing government of delaying the appointment of the substantive Director of Public Prosecutions (DPP)” (Investigator, 2013). The Minister of Justice was shopping at the Joy Supermarket in Mbuya who is a city suburb on the outskirts of Kampala. After shopping in his trolley he came to the register where he asked the price for each of the picked items in the trolley. The whole shopping spree cost the minister 160, 000 shillings. He started first buy paying it with 50,000 bills. Before picking coins from another pocket there he started to count and used time to make a jam in the star while getting enough coins to pay the balance missing of 10, 000 in small change (Ugandadrone, 2014). Retired Maj. Gen Kahinda Otafiire storms the tally center in company of security personnel for the Ruhiinda county polls and orders everybody out; and says they must leave everything inside in the hands of one of the security boys; Kahinda Otafiire came along while saying his votes have been rigged. The people and the officials are reportedly refusing to leave the centre. Gen. Kahinda Otafiire is seriously being given a run for his money according to the pre-liminery report. Capt. Mugabe Dononzio Kahonda is leading with the difference of 4773.Mind you Kahonda did not vote because he is in the prison on allegations that he forged academic documents. Otafiire is also reported to fall behind Hosea Muhanguzi. Kahinda Otafiire lost to Rtd. Cap. Kahoonda in Ruhiinda County while he is still incarcerated in prison. “Gen. Kahinda lost because of his rejection for Mitooma not become a district. This resulted into the district chairman Benon Karyaija who is very popular to part ways with him and become arch enemies. The former Mitooma district NRM chairman Tito Nsigireho, district speaker silver Tumukuratire, finance secretary Bamusiime Muhwezi have all been against Otafiire since 2010 when they defeated him and Mitoma was granted district status from Bushenyi district. Still in Mitooma district, Thomas Tayebwa won in Ruhinda North with over 80%. He was contesting against one Musinguzi. Ruhinda North is a new constituency that was curved of Ruhinda this year” (Muhwezi, 2015). If this wasn’t interesting then I don’t know; we can see that with the fix of somebody else as flag-bearer in the district, especially since the district was split of the districts in the area. Also with losing the loyalty of patrons in the area, that cost him a lot of votes. 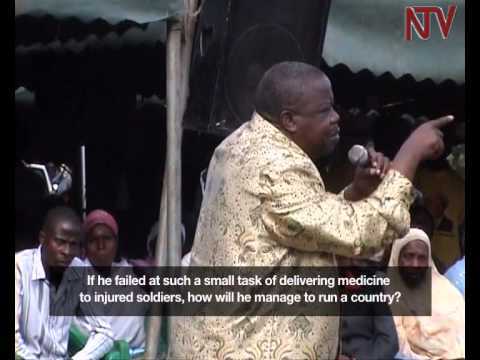 So I am sure that Mr. Otafiire can become Minister Without Portefolio or something in the 10th Parliament. Now we have seen that the future handpicked loyalist of the Party, not because the locals in Ruhinda want him anymore. Peace.